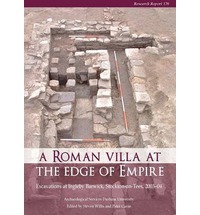 A special library event will celebrate the Roman past of Ingleby Barwick. The findings of a report into an archaeological dig in Stockton will form part of the event. The report called ‘A Roman Villa at the Edge of Empire’ details the results of an excavated Roman villa found in The Rings, part of which is now covered under the green on Lullingstone Crescent. Built between 140 and 160AD, the villa is thought to have been used until approximately 400AD and remains one of the most northern surviving from the Roman Empire. Visitors will also have a unique opportunity to see a small display of artefacts which have been uncovered from within our community over the past decade, from Roman jewellery to Bronze Age pottery and hunting tools dating back to 4000 BC. Younger visitors will also have the chance to create a variety of fun crafts and learn more about Roman life in the Tees Valley.